CHICAGO, IL – The 2009 Chicago Bears Expo presented by Chase was held at Soldier Field on Sunday May 17th 2009 located inside the United Club. 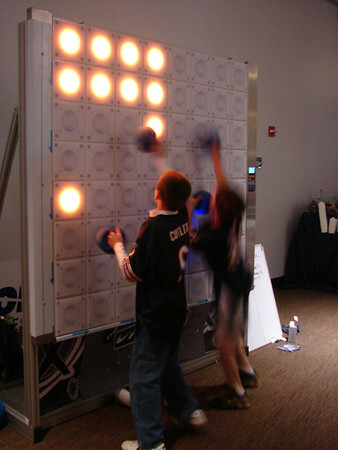 Palatine, Illinois company Exergame Fitness set up a new and exciting kids interactive area where families could play Exergaming products such as T-Wall (Interactive Light Wall) and Dance, Dance Revolution (Dance and Step Game) as part of a community wide initiative to keeping Chicago families healthy and active. The rules for T-Wall are simple but challenging: on a wall with numer ous touch surfaces, red signals light up in sequence of varying positions and speeds. The user’s task is to deactivate the light as soon as it appears by touching the light on the wall. Act and react as quickly as you can. The Wii DDR Multiplayer system is a dance and step system that allows up to four competing users at once. Simply step on the arrows on your platform and match them up to the screen accurately. There are over 50+ songs and with a wide variety of practice mats by Exergame Fitness, you can have up to 16 active players at one time competing. Exergaming inspires physical activity through the most cutting-edge active gaming experiences. It is a fun and sustainable solution to working out for kids, adults, and seniors. Exergaming is becoming one of the most proven methods to getting kids active while playing fun, interactive, a nd engaging games that promote healthy lifestyles and competitive play. “We are excited to be working events with NFL teams such as the Green Bay Packers and the Chicago Bears, as well as NBA teams such as the New Jersey Nets, helping them to promote healthy lifestyles for their communities by using our active gaming products and medically driven programming. For more information on having Exergame Fitness sponsor your sporting event , or more information on Exergaming products and services, please visit their official website at http://www.exergamefitness.cokm/ or by calling 877-668-4664. Exergame Fitness – a Motion Fitness Company, is the world’s largest distributor & supplier of Exergaming, Exerlearning, Kids Fitness Products & Programming to YMCA’s, Schools, JCC’s. Park Districts, Health Clubs, Hospitals, Kid Zones, Family Entertainment Centers, Casinos, Government/VA and more.